After you install the main LinkedIn mobile app and sign in to your LinkedIn account from the app, you are ready to start using the app. Before you do, though, it’s important to understand the capabilities now at your fingertips. 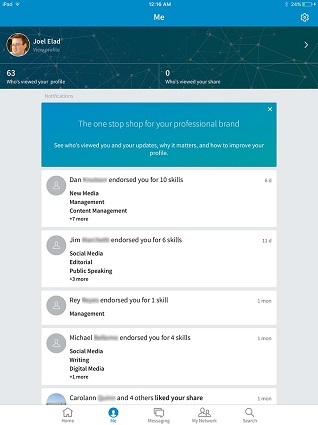 When you use the LinkedIn mobile app, you will notice a series of buttons along the bottom of the screen. These buttons allow you to easily reach the different sections of the LinkedIn app. 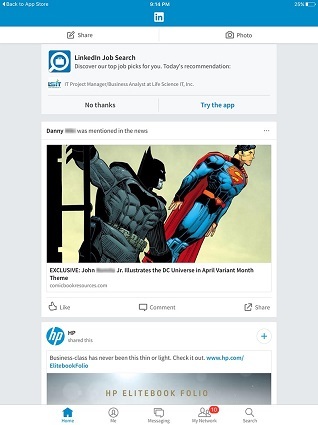 Home: This section mirrors your home page news feed, integrating elements from your first-degree connections and the news sources you follow on LinkedIn, as well as news items and blog posts that LinkedIn thinks you may like, plus job recommendations. LinkedIn takes advantage of the interactivity with your mobile device by allowing you to swipe (with your finger) stories in this section to indicate whether you find them valuable or not, and then remembers your choices and learns over time to help present a finer-tuned list of elements more to your liking. See your feed elements from LinkedIn on the home screen. Me: This section mirrors the Notifications list that LinkedIn provides you on the website, showing you when and where you are being mentioned, and who is reading your profile or your posts. You can also easily update your profile from this section so your professional brand can stay strong or get a much-needed refresh. Finally, you can update your settings from this section, by clicking the cog wheel at the top right of the screen. This is particularly important to mobile users because you can set push notifications from the settings screen, allowing you to see pop-up notifications on your device like an incoming text message so you don’t miss a new item of interest. See who’s viewed your profile and how you’re interacting with your network. Currently, you cannot edit every section of your profile in the LinkedIn mobile app. If you do not see the capability to edit that section, then you know you will have to edit it on the desktop version of LinkedIn. Messages: This section mirrors your LinkedIn Inbox, allowing you to message or chat with your connections on LinkedIn. This way, you can initiate a new conversation while on the go or follow up on existing communications while away from your desk. You can change your notifications for any given conversation or delete any conversation from the screen. My Network: This section works very similar to the feed you see on the LinkedIn website home page, where you will see a rundown of activities from people you are connected with on LinkedIn. Below, you will see a stack of “cards” where you can interact with people’s updates. 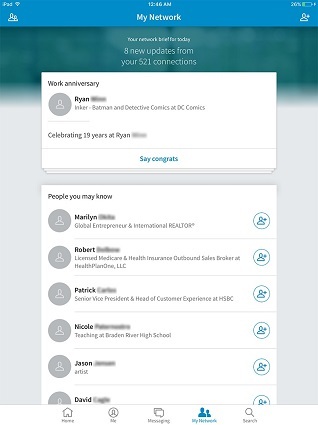 You can like or comment on updates from your connections, congratulate a contact on a work anniversary or job change, and see suggestions to stay connected. You go through the elements of this section by swiping and clicking. Interact with your network through the mobile app. You can see any incoming connection requests and act on them by clicking the People icon from the top left corner of the screen without having to log into the website. Finally, this section offers you the ability to sync with your calendar — so LinkedIn can prompt you to review a profile of someone you have a scheduled meeting with that day, for example — making you better prepared for that meeting. Search: This section mirrors the general LinkedIn search experience, where you can search for people, jobs, groups, companies, news items, or more. When you type keywords in the search bar at the top, options pop up that give you suggested search result groupings. When you search for people, you will notice that LinkedIn will try to “guess” what you are looking for by studying variations of a name you type in, coupled with your network of connections and list of companies you are employed at, to promote the most likely results at the top of the search results list. You can also type in a collection of keywords (someone’s name and employer, job skills, or alma mater, for example) to help find the person on LinkedIn.